"This is a Christmas favorite that allow us to enjoy the wonderful rich flavors and festive colors of this dessert. 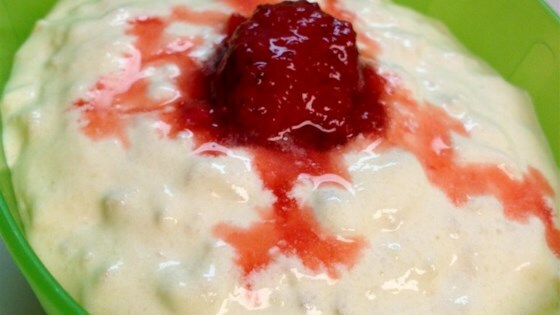 It is a rice pudding like no other. On Christmas it is a tradition to add a whole almond to the bowl. The one who gets it, wins a prize." In a saucepan, bring the milk to a boil, and then add rice. Reduce heat to simmer, and continue cooking for 20 minutes, stirring occasionally. Remove from heat, and set aside to cool to room temperature. In a small saucepan, mix the sherry and gelatin; stir over low heat until the gelatin is dissolved. Stir in the sugar until completely dissolved, and then stir in vanilla. Stir into the rice with the chopped almonds. Refrigerate. Pour cream into a bowl, and whip until light and fluffy soft peaks appear. Fold into chilled rice pudding. Serve in small bowls, topped with frozen raspberries. Easy to make. Definitely top it with berries, otherwise, it was like eating those plain-o store bought rice pudding. I didn't enjoy it but my daughter thought it was good. I did not change a thing. It was delicious. Just like when my mother made it when I was an infant. Add 1/2 tsp cinnamon to the whipped cream and this is easily the most different and delicious rice pudding ever!! !